Crash Test Of Mexican And U.S. Nissans Shows The Impact Of Fewer Airbags : Goats and Soda A car sold in the U.S. may have 10 airbags. The same model sold in a less wealthy country could have two — or maybe none. Editor's note: Updated Nov. 21 at 11:15 a.m. with a comment from Nissan. A video shows two cars crashing head-on at 35 miles per hour. (Don't worry, the drivers are crash test dummies.) One car is red, one is silver. The red car crumples like an accordion. The dummy's face collides with the steering wheel as glass flies everywhere. Then the entire front of the cabin collapses in, pushing the dummy's knees up and crushing them against the dashboard. The front of the silver car is also crushed. But the frame of the car is relatively intact This dummy flies forward in the seat belt, but front and side airbags soften the blow. The windshield cracks, but doesn't shatter. They're both Nissan cars. The red car is a 2015 Tsuru, manufactured for sale in Mexico. The silver one is a 2016 Versa, made for the U.S. market. In a crash test, Mexico's lowest-priced Nissan (left) collided with America's least expensive Nissan. The dummy's face hit the steering wheel in the Mexican model. Airbags in the American model softened the blow. Both are at the bottom of the line for price point. But there are crucial differences. Unlike the American Nissan, the Mexican model has no air bags, no antilock brakes or stability control to adjust tire speed and prevent skidding. On crash safety tests run by the nonprofit Latin New Car Assessment Program, the Versa gets four out of five stars. The Tsuru gets zero. Nissan isn't the only carmaker with different safety options for different markets. A 2017 Chevrolet Spark sold in the U.S. comes with 10 airbags. The same version sold in Mexico doesn't come with any airbags, and like the Tsuru, it scored zero stars in crash tests. 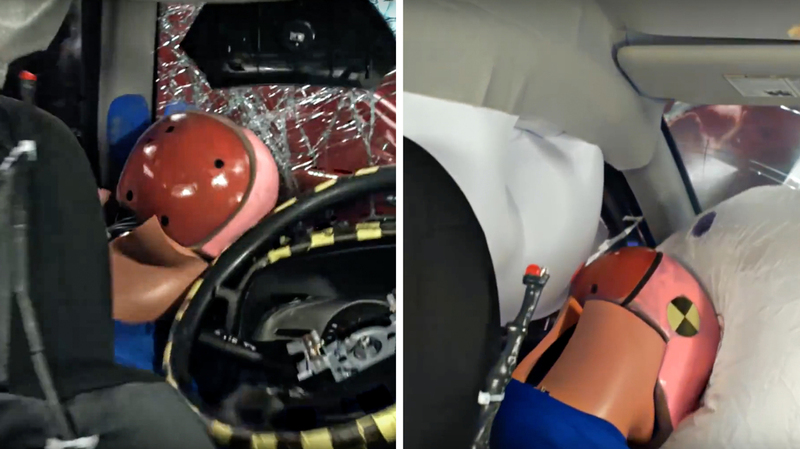 Latin NCAP, along with its affiliate Global NCAP, has crash tested dozens of cars. Hyundai, Nissan, Renault, Suzuki, Datsun, Ford, Fiat, Kia, Volkswagen and others have all sold zero-star cars in middle- and low-income countries around the world. Many of the vehicles in question lack basic safety features that have been mandatory in the U.S. and European Union for almost two decades. "How can a manufacturer justify selling a vehicle in low-income countries that they know would be illegal in high-income countries?" asks David Ward, secretary-general of Global NCAP. In the U.S., conversations about vehicle safety usually focus on the latest technology — adding cameras and crash sensors and self-driving features to limit human error. But in other countries, basic safety features are missing, and adding them could save lives, says Ward. A October 2016 report by Global NCAP and the Inter-American Development Bank estimated that enforcing the U.N.'s minimum recommended vehicle safety standards in Argentina, Chile, Mexico and Brazil could save over 40,000 people and prevent over 440,000 injuries by 2030. In 2015 only 27 percent of countries used the U.N regulations aimed at protecting drivers and passengers from front-impact crashes. Only 26 percent applied the regulations for side-impact crashes. According to Meleckidzedeck Khayesi, a technical officer working in road safety at the World Health Organization, the U.N. is working closely with Global NCAP to address the issue — both on the manufacturer end and on the consumer end. "How do we make sure quality is almost uniform irrespective of country? And how do you get people to purchase safer cars?" asks Meleckidzedeck Khayesi, a technical officer working in road safety at the World Health Organization. "You shouldn't compromise on your life just because you think the price will go up." Indeed, a manufacturer will spend about $50 per airbag, according to Alejandro Furas, the secretary-general of Latin NCAP. So that's not a huge price jump. But in many countries airbags are part of a so-called luxury package that also include leather seats and better speakers. If Mexican consumers want to purchase a Chevrolet Spark with airbags, they need to pay an additional $2,000 for the deluxe LTZ model, which comes with two airbags, one for the driver and one for the passenger. There are signs of progress. Furas says that Argentina and Brazil made airbags mandatory in 2014. Mexico just wrote new automobile safety standards to curb the sale of unsafe vehicles. But there are some caveats. The new rules are vague, says Furas. While they specify that cars need to protect the passenger in front and side collisions, they don't specify how, so it's up to the manufacturers to decide. And section 6.4 of the regulations says that manufacturers can conduct their own vehicle safety tests — and if the tests meet certain requirements they'll be considered valid forever, regardless of what other crash testers might find. Furas points out that Mexico has until 2020 to comply with the new regulations, supposedly to give manufacturers time to alter their fleets. But many Mexican cars are manufactured at local factories that already produce safer vehicles for export. The U.S. version of the Nissan Versa, for example, is manufactured in Aguascalientes, Mexico, and comes with Nissan's "advanced airbag system" that includes side-curtain airbags that drop down and keep passengers from hitting the side of the car, and supplemental airbags. The baseline Mexican version, manufactured at the same facility, comes with the option of two airbags. Some manufacturers are already taking steps to improve their made-for Mexico cars. The same day Latin NCAP announced their intention to crash-test the Tsuru, Nissan announced that it would stop selling the cars in May of 2017. "Is it a coincidence?" says Furas, "you'd have to ask Nissan." We reached out to Nissan for comment. A Nissan spokesman said the company was aware of the "car-to-car crash demonstration" test and noted: "Nissan vehicles meet or exceed safety regulations for the markets in which they are sold. The Tsuru has been one of the most popular subcompact vehicles in Mexico for more than three decades due to its affordability and its proven reliability. Nissan Mexico recently announced it will discontinue Tsuru production in May 2017." He added that Nissan in Mexico has incorporated safety features in its current vehicle lineup. When we asked GM about safety disparities, a spokesman told Goats & Soda that all of its cars will meet minimum safety standards by 2019, and that "front dual airbags and three-point seat belts in all seating positions [will be] standard" on eight models by 2018. While Furas is happy to see progress, he worries it isn't coming fast enough. Although unsafe cars are being phased off the manufacturing line, he says it could take years for them to be retired from the roads.